I didn't expect so many various drives from huge and well-known companies. For example, Plextor - there are no users who have never heard about drives of this company before. The testing technique remained the same. But we will add results of testing with a DVD+R disc. Therefore we will be able to evaluate operation of the tested drives with all latest DVD standards. Recording of CD-R and CD-RW discs (Part 2). 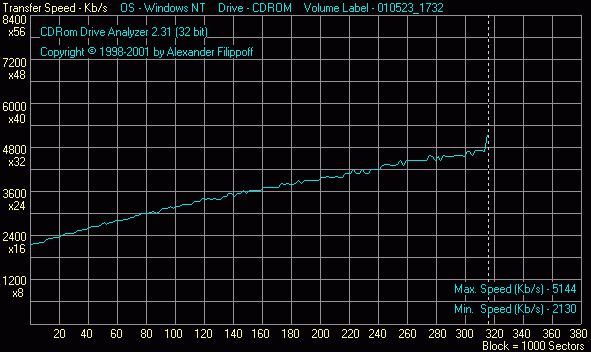 As some combo drives have lower maximum write speed, we carried out the tests at several speeds so that it can be possible to compare different devices. Recording of the CD-R SKC (cyanine, 16x rated speed). The LG's drive is the fastest in recording cyanine media at 12x. Recording of the CD-R Philips Silver Premium (phthalocyanine, 16x rated speed). 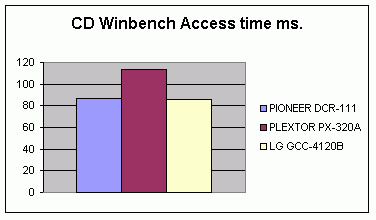 Again the LG's drive copes best of all with the phthalocyanine discs at 12x. 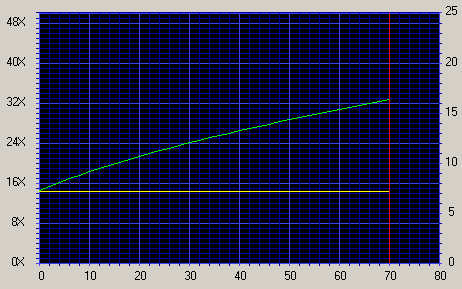 The write speed of this drive is identical for both media types. 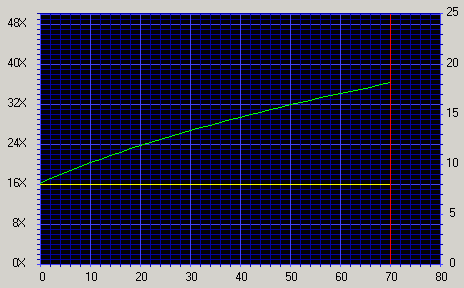 It's interesting that recording at 20x is sometimes slower than at 16x for the Plextor. It can be caused either by the Power Rec II technology used for record quality improvement or by the Z-CLV technology used at high speeds (this technology controls changes in the write speed depending on a disc's zone). Time of full formatting of a CD-RW disc in UDF format with the InCD ver. 3.24.3. CD-RW recording in UDF, 650 Mb test packet in 6500 files. 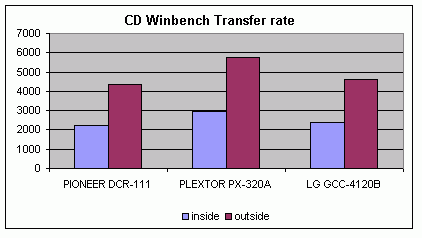 Unfortunately, the LG's drive has 8x maximum when working with high-speed CD-RW discs, hence such modest results. The Plextor's solution takes the first position in the tests with CD-RW media. Operation with 80mm CDs using a CD-RW disc, formatting and recording in UDF. 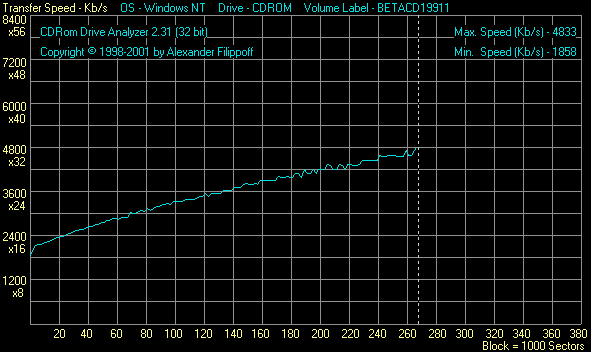 Formatting and recording of a 80mm CD-RW disc in the UDF format. 4x write speed. All drives are able to read and write 80mm discs well. BLER factor of recorded CD-R discs. For these tests we used a device described in this review. 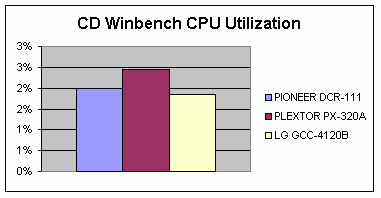 Obviously, the high write speed affected the results of the Plextor's solution, and even the Power Rec II didn't help. Nevertheless, they are not so bad. The LG's recording quality looks quite surprising. The highest Overburn is reached with the LG's model on all media types. Basic parameters of CD reading. 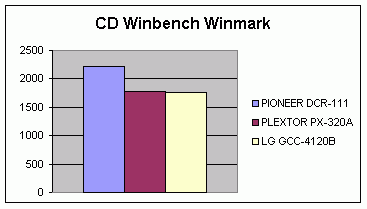 Although the Plextor's drive outscores the Pioneer's in the data rate by a great margin, it loses to the latter in the Winmark. 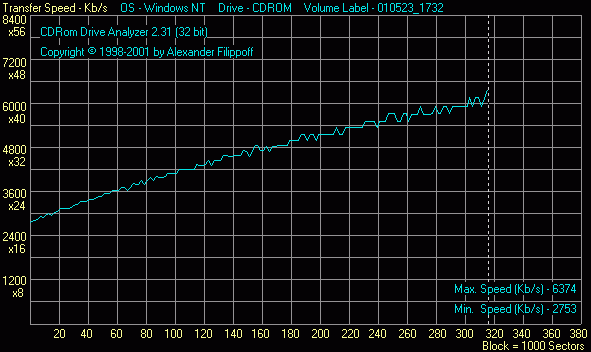 Again the Plextor's drive is ahead in the disc reading speed, but falls behind in all other parameters. 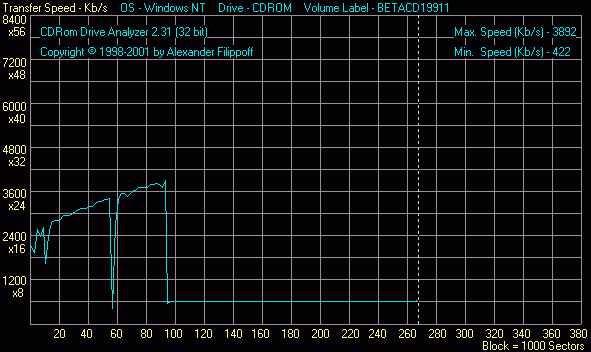 As we can see, the Plextor's drive enabled a speed reduction mechanism for the low-quality discs. If this drive decides that a given disc is of poor quality, it will reduce the speed without any further attempts to lift it up. In all other respects, all discs cope quite well with reading of low-quality CDs. There were no uncorrectable errors in the reading process. Sound track extraction from audio CDs (CDDAE 99). Plextor promised in its booklets the highest possible extraction speed. Well, it's really so. This drive leaves all its competitors far behind. Relative position (01:33.00): 00:00.00 -> incorrect! Absolute position (33:35.00): 64:00.00 -> incorrect! Relative position (00:00.00): 64:00.00 -> incorrect! Absolute position (70:02.00): 64:00.00 -> incorrect! The data obtained earlier coincide with the above results. The Plextor's drive copes with it best and fast of all. All drives read excellently the test CD. The Pioneer's drive is on the top. Basic parameters of DVD reading. As you can see, the intelligence of the Plextor's drive played a mean joke, because when working with DVD-Video the drive switches to a lower speed to reduce a noise level. Unfortunately, we were not able to raise the speed manually. DVD-Video copying with the Smart Ripper. Well, the Plextor's model has expressed a desire to work at a reduced speed with DVD-Video. Reading of the recordable DVD discs. All drives managed to read information from the DVD+R disc. But we constantly pressed the Retry button because of multiple errors with the Pioneer's disc. All drives cope nicely with this format. The highest speed is reached by the Plextor's model. The LG's drive can't read the DVD-R. The Plextor's model defines the disc's size incorrectly, hence the errors. But it did finish reading the disc. Here the Pioneer's drive is in the same situation as before. It failed to define the disc's size correctly and brought in some errors. But again, it was able to read the contents till the end. All drives play DVD-Video without any artifacts. All drives make much noise at the highest speeds. The LG's drive turned out to be the quietest one. Nevertheless, all drives are able to reduce the maximum speed with the external programs and the overall noise level can be brought to the acceptable value. The only drive we are not pleased with is the one from Pioneer. In course of operation it was the hottest. The other drives behaved better. Nevertheless, I don't recommend to place any devices close to them to avoid overheating. The LG's one worked worst of all with such discs. It vibrated a lot. The other two drives had it much better. So, we have pumped through some more combo drives from well-known manufacturers. The Plextor's solution thrives here, though it has some downsides, for example, it has problems with some recordable DVD formats, but I hope it will be corrected in its next versions.